Kamura Yoichiro is a distinguished heart surgeon who had discovered the cure to rejuvenate aging failing hearts. His philosophy in life is "Doctors, after killing three people, then they will be fully qualified". However, Kamura is unaware of the side-effect of the cure that he had invented... the heart will rupture when it is over stimulated. 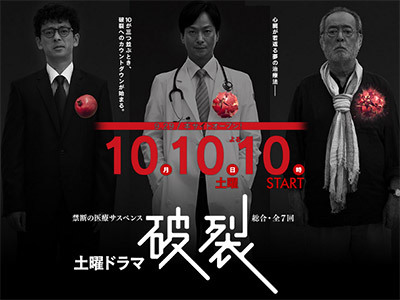 Sakuma Kazuhisa is a bureaucrat who believes that the old are a problem to society. He feels that they are good-for-nothings who should be eliminated before they destroy the country. Due to the advanced medical know-how in Japan, the life expectancy of its people has increased through the years, but yet they are not contributing to the country's growth, which is a burden to the country. Suspecting Kamura's cure to have a negative side-effect, Sakuma plots to use it to achieve his nefarious objectives. Kuraki Rentaro was once a famous actor. His heart is failing, but he wishes to star in one last film before he dies, and so he opts for the procedure under Kamura. Actually, Kamura is the illegitimate child of Kuraki, who had abandoned his mother when he was a child. Kamura hates Kuraki from the bottom of his heart, but has no choice but to perform the procedure for him. When the side-effect comes to light, will Kamura try to save his father's life?